In these hot summer months, you want to come back to a nice cool home. If your air conditioner isn’t working properly, call a company you can trust to get your air conditioning back up and running quickly. Call Northwest and you’ll quickly realize that our top priority is to keep you and your family comfortable. We’re here for you 24 hours a day, 365 days a year. For 24 hour service, you can always reach us at 563-391-1344. Our qualified technicians are skilled not only in replacing broken units but also in repairing your units to save you money. And our White Glove Guarantee provides you with assurance our technicians will leave your home as clean as it was before their arrival. While there are many different benefits to preventative maintenance, there is one quote that always seems to ring true with our customers. Think of the cooling in your home as you would your car. You wouldn’t drive your car 100,000 miles without changing the oil. Regular preventative maintenance will help you avoid those costly repairs down the line. We offer air conditioning preventative maintenance plans (1 AC unit) for $99/year (or $8.25/month). Your agreement includes your annual AC check. As a service partner you will not need to worry about paying extra for nights and weekends. 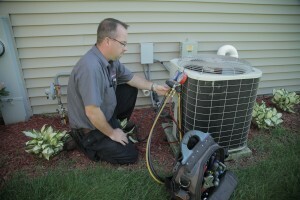 There is also an option to combine all plumbing, heating, cooling maintenance programs. Full benefits of our service agreements can be found on our Service Agreements page. Ready to upgrade your home air conditioning? Northwest is proud to offer affordable financing options through our partner, GreenSky®. For more information, please visit our financing page. Type 67074 and click "Submit"
Type 43087 and click "Submit"